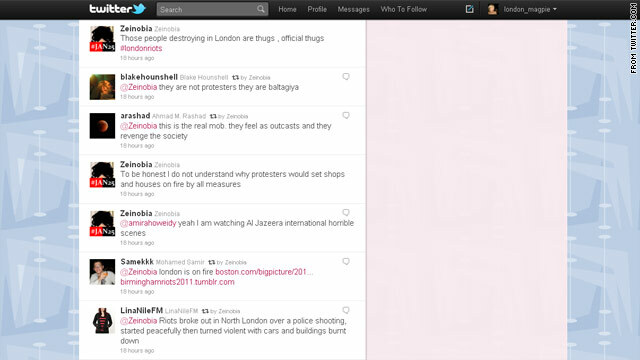 A screen grab of Egyptian blogger Zeinobia's twitter account from Monday night. London (CNN) -- Fresh from their own revolution, Egyptian bloggers tried to make sense of the scenes of looting and burning buildings coming out of the United Kingdom Monday. Violence initially sparked by the shooting death of a 29-year-old man in London spread to other parts of the nation Monday night, with dramatic scenes of blazing buildings and confrontations between police and hooded youths. The news of London's riots -- along with the ongoing violence in Syria -- has captivated many Egyptians, with some saying that the revolution is spreading to the United Kingdom, according one CNN stringer in Cairo. It is just over six months since former Egyptian president Hosni Mubarak stepped down following 18 days of protests by hundreds of thousands of Egyptians gathered in Tahrir Square in Cairo. Egyptian bloggers watched the action on Al Jazeera and CNN Monday evening, tweeting their thoughts and analyses of the situation in London. Egyptians and Tunisians took revenge for Khaled Said and Bouazizi by peacefully toppling their murdering regimes, not stealing DVD players. Egyptian blogger Zeinobia, watching CNN live Monday tweeted of correspondent Dan Rivers' report from the south London neighborhood of Peckham that: "The CNN reporter in London is acting as if he is in a war zone." Moments later, Rivers ran down the road to avoid bottles that were being thrown at him and Zeinobia tweeted "Oh God they are attacking the CNN crew in London and it was a live action." Then Zeinobia, who participated in the February 2011 revolution in Egypt, went on to share her confusion about the methods employed by the rioters: "To be honest I do not understand why protesters would set shops and houses on fire by all measures." Mosa'ab Elshamy, another blogger from Cairo who took part in the revolution, condemned the widespread looting, writing: "Egyptians and Tunisians took revenge for Khaled Said and Bouazizi by peacefully toppling their murdering regimes, not stealing DVD players." Noor Noor, an Egyptian activist and son of presidential candidate Ayman Noor reflected on events Tuesday, saying: "Politically speaking, marginalized people and injustice is everywhere and when it happens in more developed countries like England, people are more likely to react more violently to injustice. He added: "I hear people flirting with the word revolution in London but this is premature. The January 25 revolution started with certain demands that later resulted into controlled aggression. London started with aggression. "In Egypt, corruption and oppression was part of the polluted air we breathed. In England its not necessarily the norm, so injustice may hurt even more." While Sarah Abdel Rahman, an Egyptian student and activist who participated in the revolution from the start, added: "Violence is not justified but there must (be a cause) behind all this destruction. "The government should analyze it because if the kids felt like they owned their neighborhoods or related to to them, they would not have destroyed them." Tuesday, as London started to clean up the mess left by Monday's riots, many Egyptians on Twitter likened it to efforts made by them to clear up Tahrir Square after the revolution. Amr Tarek Gayed, a student at university in Cairo likens the London cleanup to the cleanup of Tahrir Square post-revolution: "While Cleaning the Streets of #London ... Exactly as we cleaned the streets of #Tahrir Square ... British or Egyptian we are all the same :D"
Blogger The Big Pharaoh wrote: "#Tahrir spirit in #London. Brits in #cleanlondon, marching with brushes exactly like what we did. http://yfrog.com/kj5oewj"
Mohamed Fadel Fahmy in Cairo contributed to this report.